Pardon the awkward title of this post. What I would like to do in this post is revisit something I mentioned in the first part of my review of Science and Human Origins in that post I mentioned a paper by Jianzhi Zhang called “Parallel Functional Changes in the Digestive RNases of Ruminants and Colobines by Divergent Amino Acid Substitutions.” The paper looked at mutations in the pancreatic RnNase of ruminants and colobines and found nine mutations in colobine RNase and five -different- mutations in ruminant RNase. The fact that Zhang found fourteen different mutations that affected pancreatic in much the same way prompted Zhang to come up with an estimate of how many different mutations can affect the function of the Rnase. He concluded that this number was somewhere between 16-44. So, of those 16-44 theoretical mutations 14 had been identified. The picture is self explanatory. 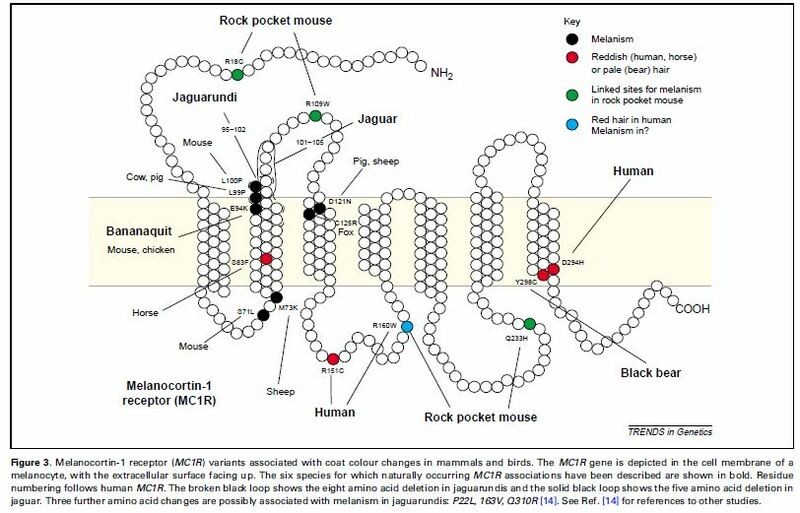 The black colored dots are mutations that cause melanism, the green dots are mutations linked to coat color changes in rock pocket mice, the red are mutations that cause red fur or hair, the blue are mutations that cause red hair in humans and possibly melanism in other species. Not shown are the mutations in the -COOH that affect coat color in retrievers and other dogs. The point is that there are many ways to a new function and to say that unless a given specified pathway is followed evolution can’t happen is clearly nonsense. Update 1: Crap! After standing in line for over two hours we find we are in the wrong place.